The energy and water cycle over the Tibetan Plateau play an important role in the Asian monsoon system, which in turn is a major component of both the energy and water cycles of the global climate system. Using field observational data observed from the GAME/Tibet (GEWEX (Global Energy and Water cycle Experiment) Asian Monsoon Experiment on the Tibetan Plateau) and the CAMP/Tibet (CEOP (Coordinated Enhanced Observing Period) Asia-Australia Monsoon Project (CAMP) on the Tibetan Plateau), some results on the local surface energy partitioning (diurnal variation, inter-monthly variation and vertical variation etc.) are presented in this study. The study on the regional surface energy partitioning is of paramount importance over heterogeneous landscape of the Tibetan Plateau and it is also one of the main scientific objectives of the GAME/Tibet and the CAMP/Tibet. Therefore, the regional distributions and their inter-monthly variations of surface heat fluxes (net radiation flux, soil heat flux, sensible heat flux and latent heat flux) are also derived by combining NOAA-14/AVHRR data with field observations. 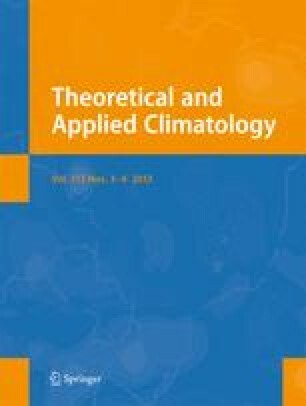 The derived results were validated by using the “ground truth”, and it shows that the derived regional distributions and their inter-monthly variations of land surface heat fluxes are reasonable by using the method proposed in this study. Further improvement of the method and its applying field were also discussed.